Over the past few years, progress for most of the computer and machine system hardware available on the market today has been defined by modest incremental leaps in technology. Software advances, on the other hand, have been marked by larger technological leaps. Software applications or “Apps” as they are often referred to, have been the real driving force behind manufacturers realizing the full potential of new hardware innovations in the metal fabricating industry. What has been processed, what is currently being processed, what is yet to be processed. System messages can be monitored remotely. Web-enabled, high-definition cameras allow users to keep a “virtual eye” on the machine without having to physically be there. 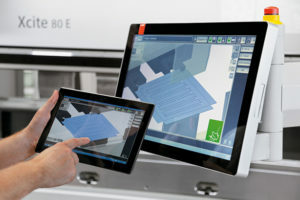 New control technologies allow a tablet to replicate some of the functions that an operator would normally perform on the machine control screen. With the Remote Tablet Machine Control, an operator can take the tablet with them and operate certain machine functions while at a different location at the machine. This also enables operators to control functions remotely without having to return to the main controller. New machine software can communicate machine and production data to Overall Equipment Effectiveness (OEE) and Overall Process Efficiency (OPE) software systems for production and statistical analysis. This analysis helps manufacturers to streamline production and increase the overall efficiency and effectiveness of their equipment. Automated Job Management Software can automatically take an order from an ERP or production planning system and manage the job from the single part CAD file, manage material types and thicknesses and the due dates for each job. Without intervention, a part order can quickly progress from the order file to the actual parts on hand very quickly. New CAD/CAM functions can produce part identification codes for laser etching that can then be scanned by smartphones and laser scanners. On-the-spot identification of parts and automatic program uploads at the machines provide for greater quality control measures and part traceability. While we all recognize the value of new and improved equipment, we sometimes overlook the competitive advantages that are being created by innovative software. Taken together, advances in both machine and software design drive greater productivity and efficiency, and provide the competitive differentiation that companies are looking to achieve.